It begins with finding a suitable time of the year to do it. As we sail from September through to June, and ski from June to October, it doesn’t leave many spare weekends to fit this essential task in! This year the timing was dictated by me booking in to have Wildwood wrapped! She has been in need of a new coat of paint on her topsides for the last five years, but I have procrastinated, filled and repaired various spots. The time has come to cough up with the cash and get this job done. As with many practical things, I have a bad habit of underestimating how long and how difficult a task is going to take. Removing the current name sticker for example. I assumed that we would just be able to pull it off, but after two full days of scraping, scratching, chipping, and heating, there is still half the name on one side still to come off! I set myself the task of inspecting all the dents and scratches along the side. I am not sure that I should be given a scraper – I most certainly can’t be trusted with power tools, however a scraper is just as bad. So I pick away at a tiny crack in the paint and within seconds I have got a huge patch the size of my hand that now requires a major repair. My justification for this is that I would rather know now what is going on behind this crack now before it is eternally sealed behind the plastic wrap. 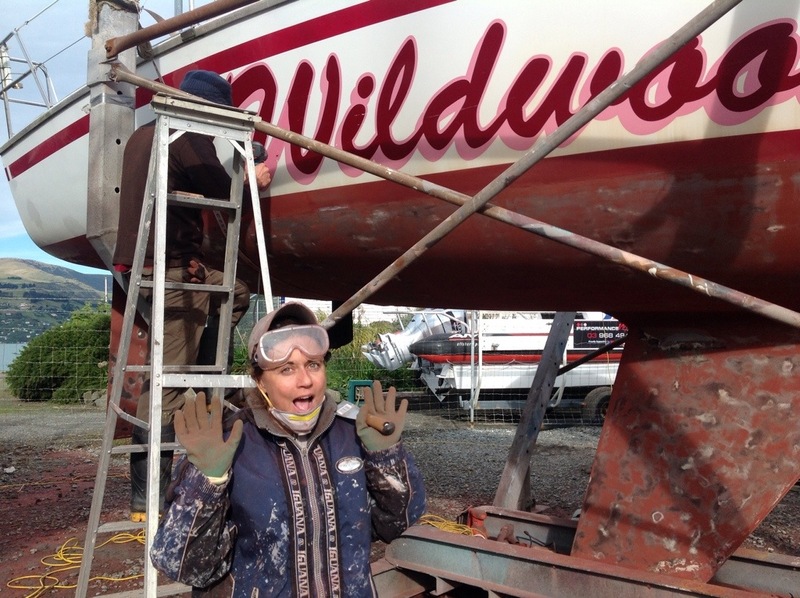 Being a wooden boat the fear of rotten bits is in the back of my mind and if the wrap is anywhere near as sticky as the name sticker – then this stuff is never coming off! We had been invited to a ball on the Saturday night. So three hours before the ball was about to start, I was dressed in my dirtiest clothes looking as scruffy as I ever do and just a couple of hours later I was looking as flash as I ever do. Amazing what a bit of soap and shampoo can do! I can’t wait to hear more about your adventure – do you have a timescale or anything like that? Very exciting! Thanks! At present we are having lots of fun sailing our 30′ yacht in the South Island of New Zealand while the kids grow up. Then we plan on buying a larger yacht in the Med and starting from there! Still a few years off, but there is lots of work in the planning stages, and my blog has been a great place for me to consolidate all the information I have been gathering up! Love it – love the pics! I am just like you – getting into it with the scruffy clothes and scrubbing up ( I don’t look as glamorous as you though!) 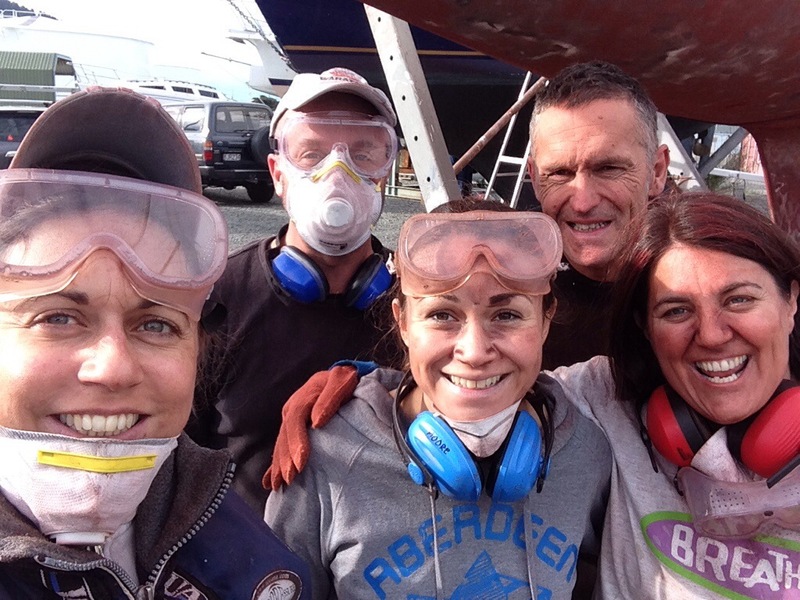 by the by – please send your crew over to France, we haul out tomorrow! sigh! I am sure if you give them beer and take them cruising the French Canals they would love to come over Jackie! I will forward on the invitation! I have just put a message on your Facebook page asking how you were getting on with the survey etc? How is the French going? Hope all is well.